Oh my, if you don't think corrupt corporations are trying to control the global food supply, read this! Via naturalnews.com. This is mind-blowing, especially if other countries allow this to happen! We need this in every state in the US. Please reach out to all your state reps & contacts to protect health & food freedom. S.510 "Food Safety" bill will NOT do the job. 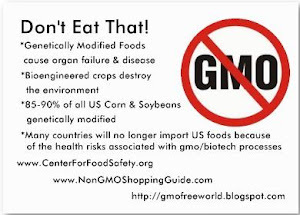 GMWatch on facebook, the web at www.gmwatch.org and Twitter at http://twitter.com/gmwatch is a great resource for up to the date GMO news and more! GMWatch is an independent non-profit making organisation founded in 1998. We seek to counter the enormous corporate political power and propaganda of the biotech industry. WikiLeaks - US Against Europe Over Monsanto GM Crops - Demcracy Now! Interview with Jeffrey Smith this week on Democracy Now exposes shocking truths about massive collateral dangers from GMOs and the corruption involved in pushing GMOs. Very significant info here! Rockefellers and Heads of Monsanto Won't Eat GMOs! Rockefellers and heads of Monsanto have their own farm and will only eat THEIR OWN FOOD, not this poisonous stuff their dishing out to the rest of us. You may be familiar with Jamie Oliver, the chef who brought us the wonderful reality show last year called "Food Revolution". He has posted a few photos of his own garden on Facebook to inspire us. Mainstream Media Agrees Food Safety Bill Will Do Nothing to Improve Food Safety! Via NaturalNews.com: A recent editorial in Forbes magazine online slams the recent U.S. Food and Drug Administration (FDA) "Food Safety Modernization Act" for being a huge waste of taxpayer money, and an effort that will do absolutely nothing to actually improve food safety. herbacides - eventually turning your gut into a pesticide factory! Thank you Dr. Oz and Jeffrey Smith for bringing this to mainstream media! (NaturalNews) The Food Safety Modernization Act looks like it's headed to become law. It's being hailed as a "breakthrough" achievement in food safety, and it would hand vast new powers and funding to the FDA so that it can clean up the food supply and protect all Americans from food-borne pathogens. There's just one problem with all this: It's all a big lie. Here's a whopper the mainstream media won't dare report: Out of the 1,809 people who die in America every year from food-borne pathogens (CDC estimate), only a fraction die from the manufacturer's contamination of fresh produce. By far the majority of food poisoning is caused by the consumption of spoiled processed foods, dead foods and animal-human transmission of pathogens. In terms of food-borne illness, many of the deaths come from things like spoiled tomato sauce, spoiled canned foods and spoiled pasteurized milk. S 510, of course, does absolutely nothing to address these food contamination deaths, since those foods are considered "sterilized" at the time of sale. Not true. S.510 merely requires the FDA to have "reason to believe" a food is contaminated. So right there, that means all raw milk will be targeted by the FDA because even without conducting any scientific tests at all, the FDA can say it has "reason to believe" the milk is contaminated merely because it is raw. In other words, in negotiating this bill, the U.S. Senate removed the requirement that the FDA needed "credible evidence" in order to recall a product and, instead, replaced that with the FDA only needing "reason to believe." It is utterly amazing that the U.S. Congress would give the FDA to conduct large-scale product recalls and even imprison people based entirely on what the agency "has reason to believe." Last time I checked, the FDA held some pretty bizarre (if not downright moronic) beliefs, including this jaw-dropping whopper: The FDA literally believes that there is no food, no herb, no vitamin or supplement that has any ability to prevent disease of any kind. They don't even believe limes can prevent scurvy, and you'd have to nutritionally illiterate to believe that. Yep, it's true: Amid all the fear-mongering over salmonella, everybody forgot to notice that the vast majority of fresh chickens sold at grocery stores every single day are widely contaminated with salmonella (http://www.naturalnews.com/028661_c...). Yet S 510 does absolutely nothing to address this. It's not even mentioned in the bill. In fact, it is these contaminated chickens that end up cross-contaminating the fresh produce in many kitchens across America. So the so-called "food poisoning" that's often blamed on spinach or onions often originates with the contaminated chicken meat people bring home and slice on their kitchen cutting boards. The Tester Amendment, which was finally included in S.510, excludes farmers who sell less than $500,000 worth of food each year from the more onerous paperwork and compliance burdens described in the bill. But this dollar amount is not indexed to inflation, meaning that as the U.S. dollar continues to lose value due to the Federal Reserve counterfeiting machine running at full speed (more "quantitative easing," anyone? ), food prices will continue to skyrocket -- and this will shift even small family farms into the $500,000 sales range within just a few years. The FDA already has the power to effectively recall foods by publicly announcing a product has been found to be contaminated. The FDA already has the power to confiscate "misbranded" products, too, and it could easily use this power to halt the sale of contaminated food items. The food contamination problem is an UPSTREAM problem where you've got to reform the factory animal operations that now dominate the American meat industry. S.510, however, does absolutely nothing to address this. Factory animal farms aren't even addressed in the bill! To think that the FDA -- the very same agency responsible for the Big Pharma death machine -- is now going to "save us" by controlling food safety is highly irrational. 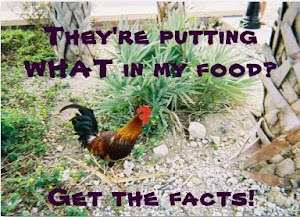 Lie #8 - The FDA just wants to make food "safer"
Actually, the FDA wants to make the food more DEAD. Both the FDA and the USDA are vocal opponents of live food. They think that the only safe food is sterilized food, which is why they've supported the fumigation, pasteurization and irradiation efforts that have been pushed over the last few years. One of the main sections of S.510 addresses "food smuggling." Yep -- people smuggling food across the country. If you've never heard of this problem that's because it's not actually a problem. But there's a reason why they put this into the bill: Because they're probably planning on criminalizing fresh produce and then arresting people for transporting broccoli with the "intent to distribute." Yep, farmers bringing fresh produce to sell at the weekend farmer's market could soon be arrested and imprisoned as if they were drug smugglers. Hence the need for the "food smuggling" provisions of S.510. Actually, even with S.510 in place, America's food supply is among the most chemically contaminated in the world, second only to China. You can find mercury in the seafood, BPA in the canned soup, yeast extract (MSG) in the "natural" potato chips, and artificial petrochemical coloring agents in children's foods. Eating the "Standard American Diet" is probably the single most harmful thing a person can do for their health. It's the fastest way to get cancer, diabetes and heart disease. Every nation in the world that begins to consume the American diet starts to show record rates of degenerative disease within one generation. This is the "safe food" that the U.S. Senate is now pushing on everyone. Feel free to share this list! Please give the courtesy of credit to this author and a clickable link back to NaturalNews.com. We are working hard to fight for freedom and educate the public about why we need to resist these "Big Government solutions" that trample over our Constitutional rights to life, liberty and the pursuit of happiness (which, in my mind, includes buying fresh produce at the farmer's market).